We are contemplating and speaking of samadhi lately. Samadhi is a theme that threads throughout the yogic canon. The word refers to a state of being which could be loosely translated as “equal vision.” It is the state of Self-realization in which one experiences unity with the universe. The word’s etymology gives a clue to its deep meaning. “Sama” is a Sanskrit term for evenness, sameness, or togetherness and it shares a root with the English word “same.” “Dhi,” when you see it in Sanskrit can be a reference to the mind, intellect, or vision, so it is the vision of equality. I have been watching the “Nova” series called “The Fabric of the Cosmos” and it is all about the scientific quest for the underlying unity of all being, called the Unified Field Theory, which describes the attempt to unify the fundamental forces of physics into a single theoretical framework. I was struck by the title, “Fabric…” because Tantra, the essence of yogic philosophy, is a word meaning, roughly, “Loom” and the Tantric seers describe reality as a fabric, an interweaving of opposites. Human beings are on a search for the underlying oneness of it all. Kashmir Shaivism says that this underlying principle is consciousness. A yogi practices this vision: All is Consciousness. That sense of subject – object unity is samadhi. Sometimes, such a yogi is given the grace to have this conviction arise spontaneously, and she can eventually produce this shift of awareness, from differentiation to the blissful sense of Unity, at will. This occurs through the cultivation or remembrance of that state, which is the self-effort of Yoga. As it is stated by Kshemaraja in the Pratyabhijna-hrdayam, sutra 19: The Permanent attainment of samadhi is established by contemplating one’s identity with Consciousness again and again in the state following meditation, which is full of the imprints of samadhi. My Guru used to repeat frequently that “Yoga is equal vision.” And he kept the strictest egalitarian standards in his ashram. One of the stunning moments of my time with Baba was a few seconds when i came eye to eye with him in a conversation. He had beckoned me over to speak with him, and as i looked him in the eye i saw something i had never seen before: the gaze of a perfect equal. It blew my mind because i truly revered him yet he was looking at me with absolutely no trace of differentiation, judgement or superiority. And i realized i had never seen this before in my life. The rigorous egalitarianism in the ashram meant that nobody, no how,was able to get away with being self-important. Baba would often say “We are all dogs in the court of Nityananda.” Nityananda was my Guru’s Guru, and he was an astonishing being whose very presence put a person into this state of samadhi. In that state, no one is above or below anyone else: there is no hierarchical thinking, and every one just IS, another emanation of the Self, and there is no judgement. Nityananda was famous for being almost entirely naked and for living in the utmost simplicity, first homeless in nature, and later in a simple structure built for him by his devotees. And he never owned anything or went anywhere. Yet all kinds of people from diverse social strata would come to be in his profoundly serene atmosphere; and a magistrate, a millionaire or a scholar would sit down with a washerwoman, a mendicant or a monk, and all receive the same thing: samadhi, the utterly peaceful awareness of eternal being. 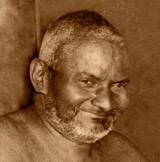 Nityananda’s nakedness, his radical poverty, was a teaching in itself. It reminds me of Michaelangelo’s “Last Judgement” on the walls of the Sistine chapel. If look at it you will notice the most striking thing about it is, that everybody is naked! In that condition, who is high-ranking and who is low? Nakedness is a great equalizer. The social implication of the state of samadhi is that everyone is equal. You see in the New Testament a lot of teachings that pertain to this aspect of spiritual knowledge. Do you remember the moment when before sitting down to the last supper, Jesus knelt to wash the disciple’s feet? He was behaving the way to humblest servant would do, the servant of the servants. The disciples were horrified and Peter even at first refused to allow it. And Christ told him, “then you cant be one of mine.” And it was at this time that Jesus told them: “A new commandment I give you: Love one another. As I have loved you, so you must love one another. By this everyone will know that you are my disciples, if you love one another.” The equilibrating knowledge of oneness is accomplished through love, and is experienced as love, so love is the way, the means and the goal. Love is the unifying principle. There is an aphorism from the Shiva Sutra’s i am fond of quoting because it contains the rationale behind Hatha Yoga practice: prāna samācāre samadarśanam, which means: Evenness of prana brings about equality consciousness. One thing about the state of samadhi, it feels like your energy is purring, flowing perfectly consistently and tranquilly. And what we do when we flip our bodies around the way we do in a class is try to introduce the prana, or, if you will the blood supply, evenly throughout the system. This ‘evenness of prana’ promotes the feeling of connected oneness with the environment. One of the ways we ‘boost’ this effect is by loving our prana, loving our breath. Through this we can partake of the feast of samadhi in an instant, and make it the food of our earthly body.